If you talk to my Grandpa, he remembers having cute phone conversations with my Grandma while he was working in America. He would call her every couple of weeks while living with his brothers in Colonia and find out how she and the family were doing. Well, he wouldn’t actually call her… he would have to call the grocery store that was across the street from their house in Magdalena and ask the owner, who was a friend of theirs, to please get Emilia. According to Grandpa-Next-Door that was the owner’s name. Antonio would yell across the street and tell my grandma that she had a phone call. After a few minutes, she would get to the phone and the two love-birds would chat for a few minutes. According to Grandpa, everything was just fine. He would work, send money, call and check-in every couple of weeks, and all the while Grandma would care for six children all by herself. What problems could there possibly be? According to my Dad, all was not well in the land of Magdalena. “Together here or together there, but no more separate,” Grandma said. According to my Dad, Grandma wasn’t convinced about America right away. It took her some time and some persuasion to realize that emigrating to the U.S. from Mexico was the best decision for her and the family. According to my Dad, it was this sage wisdom that finally won Grandma over to the idea of moving. Up until then she wasn’t sure about living among the gringos on their home turf. According to my Grandpa, my Dad doesn’t know what he is talking about. Grandma was always certain about their move to America. According to Grandpa, she was convinced by a short trip to America that she took with her two youngest children at the time (that would be my Tía Eva and my Tío Navi just to give you even more names to forget). She got a visitor’s visa and stayed with him for a couple of months in Colonia. According to Grandpa, his wife fell in love with America on that trip and there was no deterring her on her quest to move the family across the border for a better future. It was the trip that convinced Grandma and not some pearl of wisdom that her eldest son gave her about the reality of life as a poor family in America being superior to that of one in Mexico. According to me, it doesn’t really matter whether it was a short visit to America or a short comment about America that brought my family here. The point is that we are here. According to me, we are much better off because of the decision to move and that is the end of it. According to me, all of my family members who decided to move here are heroes because they didn’t have to do it. Well, maybe my Dad had to do it because he was only eight years old. This didn’t stop him from asking to go back to Mexico, however, after finding it difficult to adjust. According to my Grandpa, he asked every single day for the entire first year that they were in the US if they could go back to Magdalena. Grandpa handled it by telling him this. “Okay, go ahead and go by yourself,” he said. “No Mom?” young Toribio said. “No, she’s going to stay here,” Grandpa said. After this Dad decided to give America another shot. Thank God that he did. If he didn’t, who knows if he would have met my mom or if I would even exist? What would you have done without me writing this awesome blog for you guys? Rose and Toribio Preciado, just barely in there twenties. 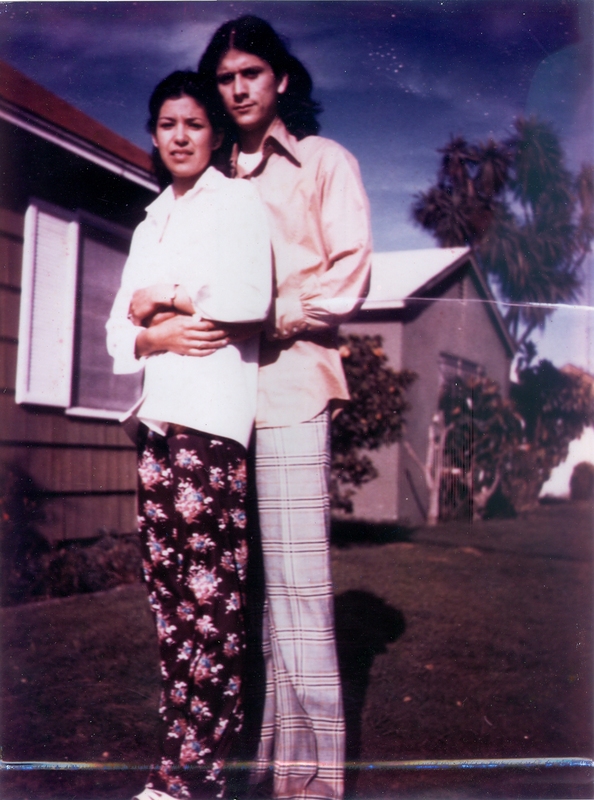 Proud parents of Josiah Preciado and lovers of bell bottoms to this day! Such a great story! We (and a passleful of other folks) are so thankful your grandparents decided to brave life among the gringos! It just wouldn’t be the same without you all! Love the stories…keep writing! Your family is rich with stories worth sharing….The pic is a hoot!